KENNEDY SPACE CENTER, FL--Three days after a last-second launch abort, an unmanned cargo ship designed and built as a private venture blasted off early Tuesday and streaked into orbit, kicking off a complex test flight to pave the way for commercial flights to the International Space Station. With a replacement valve installed in the engine that derailed a launch try Saturday, all nine of the booster's first stage powerplants roared to life on time at 3:44:38 a.m. EDT (GMT-4), throttling up to full thrust with a rush of fiery exhaust. An instant later, after lightning-fast computer checks to verify the performance of the SpaceX-designed Merlin engines, the rocket was released from its firing stand and quickly climbed away from launch complex 41 at the Cape Canaveral Air Force Station. 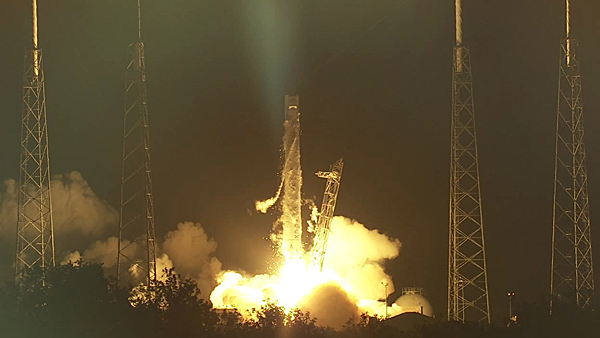 To reach the International Space Station, the Falcon 9 and the solar-powered Dragon cargo ship had to take off at roughly the moment Earth's rotation carried the launch pad into the plane of the space station's orbit. Any hiccups in the countdown would have triggered another frustrating three-day launch delay for a flight already running months behind schedule. But as it turned out, the company did not need an extended window. There were no technical problems of any significance the second time around, the weather cooperated and a few minutes after the space station passed over the launch site, the 157-foot-tall rocket took off on a northeasterly trajectory and set off after its quarry. "Every bit of adrenalin in my body released at that point," said SpaceX founder Elon Musk. "It's obviously an extremely intense moment. The main thing I was wondering was would we have a valve-related issue on launch, would the first stage perform nominally? But it worked perfectly. I was really glad to see that." The first stage engines burned for three minutes, shutting down in sequence as their propellants were exhausted. The first stage then fell away and the single Merlin engine powering the rocket's second stage ignited to continue the push to orbit. Live video from cameras mounted on the Falcon nine showed the launch site falling away from the rapidly accelerating rocket and later, the nozzle of the second stage engine, glowing red with the heat of combustion. The second stage engine shut down as planned nine minutes and 14 seconds after liftoff. About 35 seconds later, the Dragon capsule separated from the second stage, visible in a forward-pointing camera as it floated away into space. A few moments after that, protective covers were jettisoned and the capsule's two solar panels unfolded to begin generating power and recharging the craft's batteries. About three hours after launch, flight controllers successfully opened a cover exposing the Dragon's navigation sensors to space. It was a picture-perfect start to a long-awaited mission hailed as the dawn of a new era of commercial spaceflight. "For us it's like winning the Super Bowl," Musk told reporters after the launching. "It heralds the dawn of a new era of space exploration, one where there is a significant commercial space element. Comparing commercial, for-profit space operations with the dawn of the internet, Musk said "I think we're at a similar inflection point for space. I hope and I believe this mission will be historic in marking that turning point towards a rapid advancement in space transportation technology." Bill Gerstenmaier, director of space operations at NASA headquarters in Washington, congratulated SpaceX "for just an absolutely amazing countdown, launch and orbit insertion today." "I've had the pleasure of working down here at the Cape with a lot of fantastic teams that have put together a lot of quality rockets and launched a lot of amazing things. I tell you, the SpaceX team, there is none better than this team that has really done a phenomenal job today." Said John Holdren, White House assistant to the president for science and technology "Every launch into space is a thrilling event, but this one is especially exciting because it represents the potential of a new era in American spaceflight. "Partnering with U.S. companies such as SpaceX to provide cargo and eventually crew service to the International Space Station is a cornerstone of the president’s plan for maintaining America’s leadership in space," he said in a statement." This was the third flight of a Falcon 9 rocket and only the second for the company's Dragon cargo capsule. But it is the company's first mission designed to carry the Dragon all the way to the space station. SpaceX holds a $1.6 billion NASA contract to launch at least 12 unmanned cargo missions to the lab complex, but only after test flights confirm the safety and reliability of the rocket and cargo capsule. "This is also absolutely critical to space station," Gerstenmaier said "This cargo resupply is absolutely needed for station to meet its research potential and to move forward. So I'm very proud of what the team has done and I'm very glad they had a wonderful start to this mission. But again, the caution for all of us is there's still a lot to go." The test flights are being carried out under a contract valued at up to $396 million. In a separate business arrangement, SpaceX launched a payload attached to the Falcon 9's second stage that was provided by Celestis, a Houston-based company that offers "memorial spaceflights" for cremated remains. Ashes from more than 300 souls were believed to be aboard the second stage, including Mercury astronaut Gordon Cooper and "Star Trek" actor James Doohan. Three Falcon 9/Dragon test flights originally were planned, but after a successful test flight in December 2010, SpaceX successfully lobbied NASA to combine the second and third tests into a single mission. As a result, the Dragon spacecraft launched Tuesday will spend much of the day Thursday carrying out maneuvers near the station to test the craft's flight control computers and navigation systems, and to check out the critical communications link between the station crew and the spacecraft. If all of that goes well -- work originally planned for the second of the three initial planned test flights -- SpaceX flight controllers will attempt the final phases of the rendezvous on Friday to complete the objectives of the third test flight, guiding the craft to a point within about 30 feet of the space station. At that point, with the capsule's thrusters disabled, flight engineer Donald Pettit, operating the station's robot arm, will lock onto the cargo ship just after 8 a.m. and guide it to a berthing at the Earth-facing port of the forward Harmony module. The station crew plans to open hatches leading into the Dragon capsule on Saturday to begin unloading about 1,100 pounds of equipment and supplies. If all goes well, the spacecraft will be unloaded and detached from the station on May 31 for a parachute-assisted splashdown in the Pacific Ocean off the coast of California.